Execution site: A roundel in the pavement marks where 105 Catholics were martyred during the Reformation. 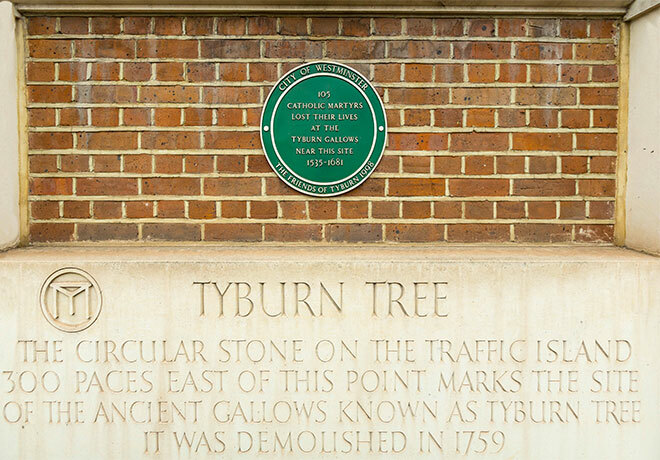 They were among more than 1000 people who went to their death at the Tyburn Tree. Photo: Alan Edgecomb. Brisbane photo-journalist Alan Edgecomb writes about his visit to the Tyburn Tree, a place in London where 105 Catholics were martyred during the Reformation. THEY were hanged, drawn and quartered for refusing to take the oath attached to the Act of Succession. I know little of English history, so I was surprised when Borsbane Oratory priest Fr Adrian Sharp spoke about Tyburn Tree, a site in London where more than 1000 people met their death. They included 105 beatified and canonised Catholic martyrs of the Reformation. During my visit to London, I made the pilgrimage to the site near Marble Arch, just a few minutes’ walk from the busy Oxford Street where Christmas shoppers were jostling for the few inches, or millimetres, of pavement space. Not sure if they should keep left or right, Londoners just walk anywhere. 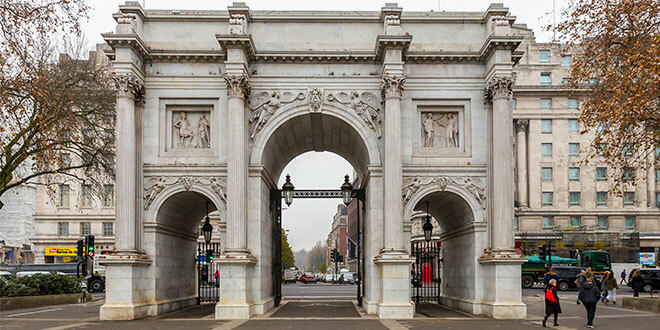 For more than 200 years, an enormous three-sided structure stood on what is now the junction of Bayswater Road and Edgware Road. It was originally a site of public execution in the 12th century and later became the principal location for public executions in London – The King’s Gallows – and was placed outside the boundary of the city. Prisoners sentenced to death would make their last journey by cart down what is now known as Oxford Street to the gallows. The journey could take up to three hours due to the number of people crowding the route and wanting to get one last look at the condemned. I can’t imagine how the doomed person must have felt, being subjected to the jeers of the crowds with the knowledge that you were about to be hung by the neck and, if lucky, dying before being disembowelled and cut into pieces. Martyr markers: The monument above points to the nearby site of the Tyburn Tree which was demolished in 1759. Photo: Alan Edgecomb. The lengths that the authorities employed to deter crime and make their enemies disappear was just horrendous. On May 4, 1535, St John Houghton and four others became the first martyrs of the Reformation when they were hanged, drawn and quartered for refusing to take the oath attached to the Act of Succession. This Act required all those who were asked to take the oath to recognise Anne Boleyn as King Henry VIII’s lawful wife and their children legitimate heirs to the throne. Anyone who refused to take the oath was guilty of treason. Queen Elizabeth had the gallows rebuilt into the infamous three-sided Tyburn Tree in 1571. This was a permanent triangular frame where 24 people could be hanged at one time, and was frequently used to execute Catholics in the religious persecution in the years afterwards. 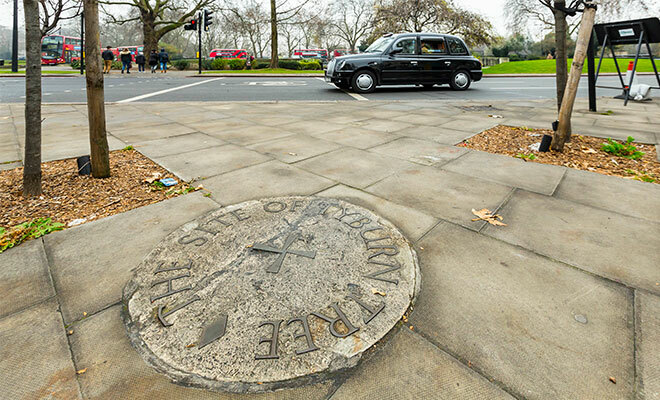 All that remains today, as a visible reminder of a dark period of British history, is a stone roundel on the ground that can be easily missed as it looks part of the pavement. Three oak trees now stand on the site of the original gallows as London traffic whizzes by. A memorial in the Chapel of St George and the English Martyrs at Westminster Cathedral, a little over two kilometres from Tyrburn. Photo: Alan Edgecomb. A little more than 300m in a westerly direction along Bayswater Road is the Tyburn Convent, dedicated to the memory of martyrs executed at Tyburn. The Benedictine Adorers of the Sacred Heart of Jesus of Montmartre maintain a permanent adoration behind tall white bars that separate the sanctuary and the body of the chapel. 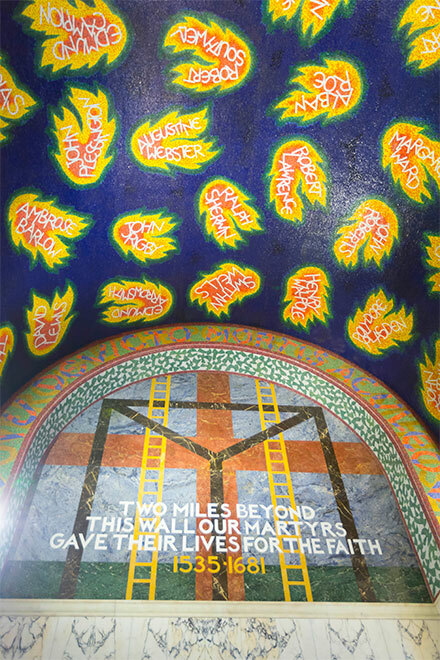 Westminster Cathedral lies 2.5km from Tyburn, and in the Chapel of St George and the English Martyrs is a colourful memorial to the martyrs of Tyburn. Recently, a BBC drama about Guy Fawkes’ plan to blow up the House of Lords and kill King James I in the early 17th century, has drawn criticism for its violence. The BBC said the offending scenes were “grounded in historical fact” and reflected what took place at the time. The first episode showed a woman being pressed to death and a priest being disembowelled. 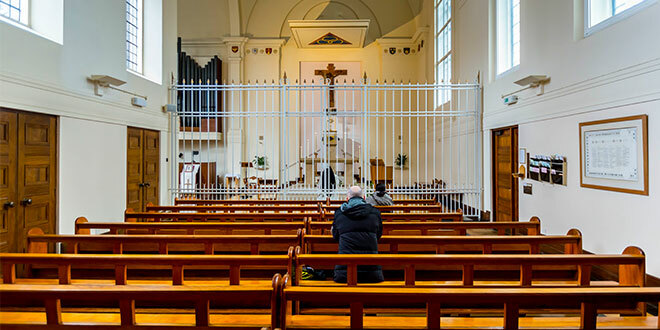 Prayerful presence: The Benedictine Adorers of the Sacred Heart of Jesus of Montmartre maintain permanent adoration behind tall white bars at the sanctuary their chapel at the Tyburn Convent. Photo: Alan Edgecomb.